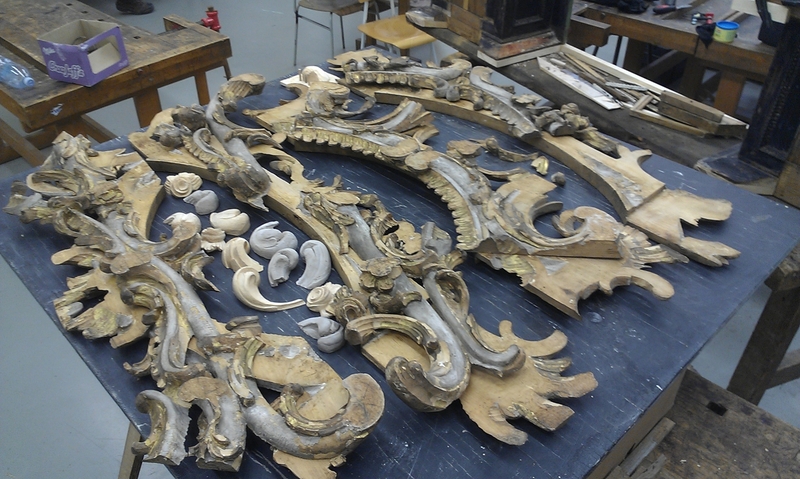 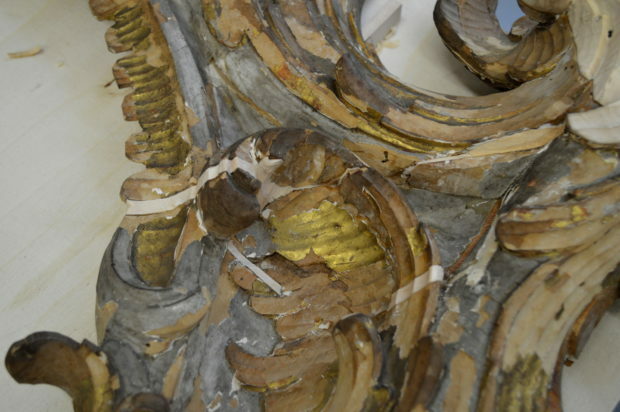 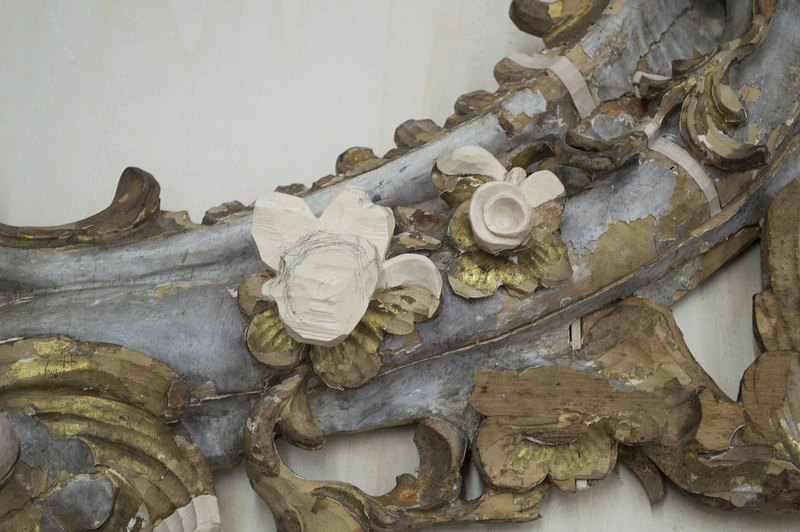 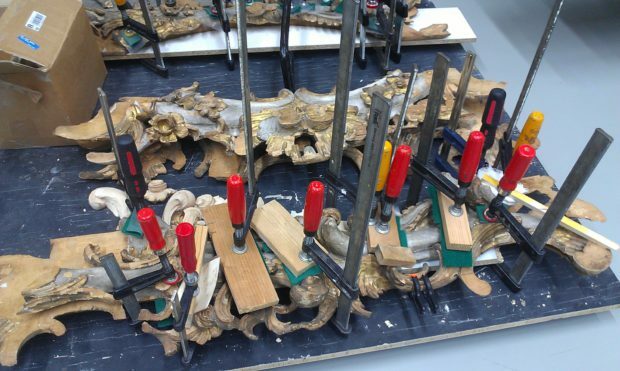 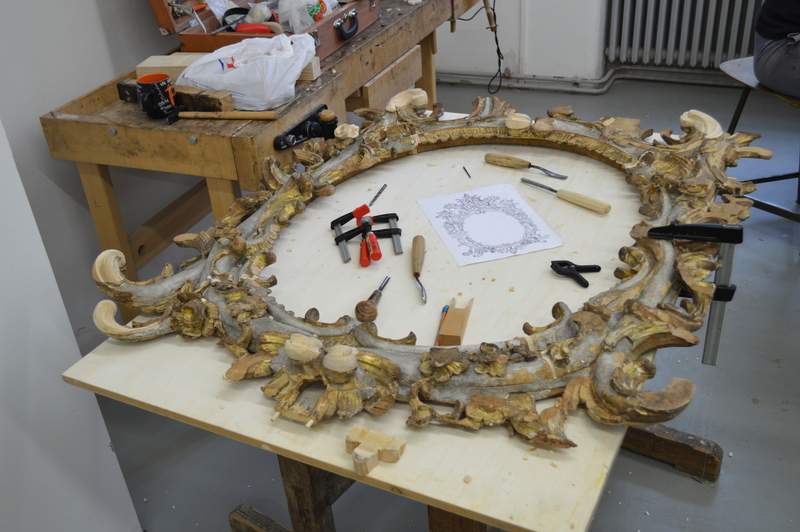 This article is about my work on restoring of rocoque painting frame as part of studies. 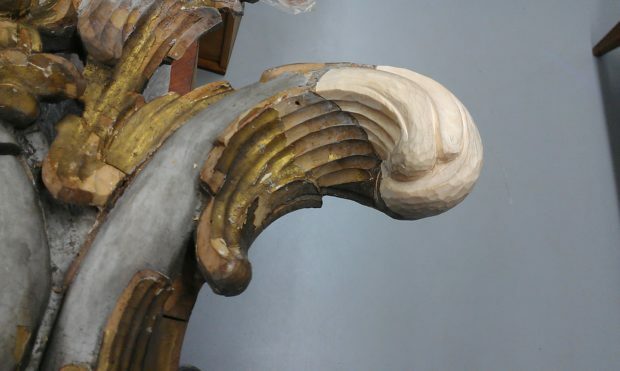 It’s an item from Kroměříž Archdiocesan Museum (i.n. 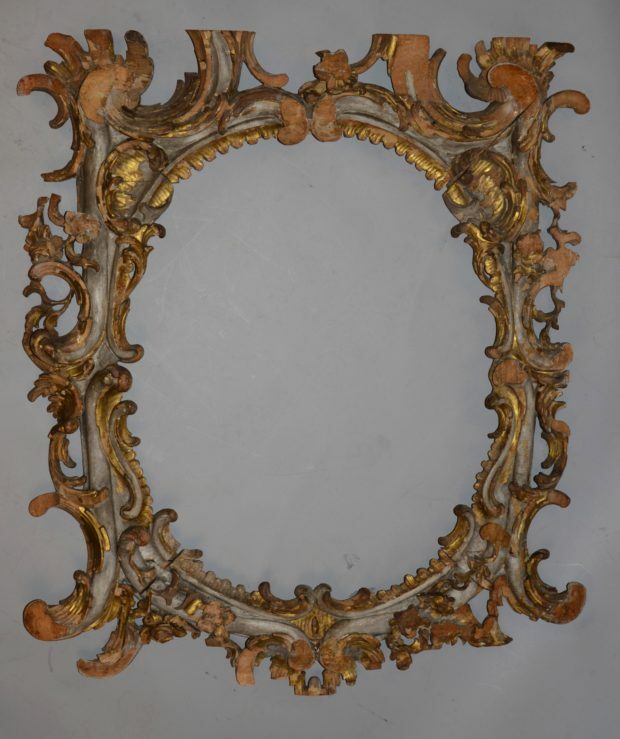 1171, w. 98cm, h. 120cm). The frame is oval-shaped belonging to painting of John of Nepomuk. 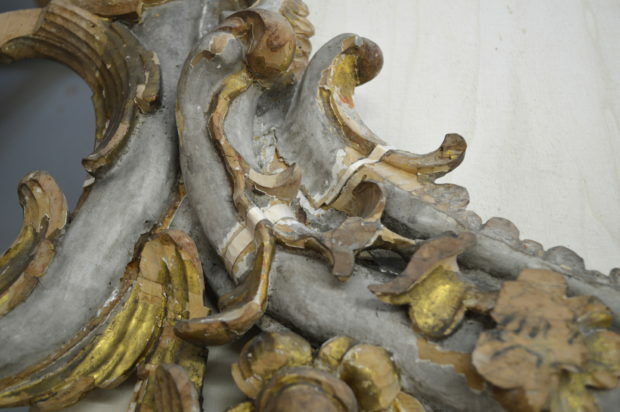 Surface is polychromed with gilding and gray paint. 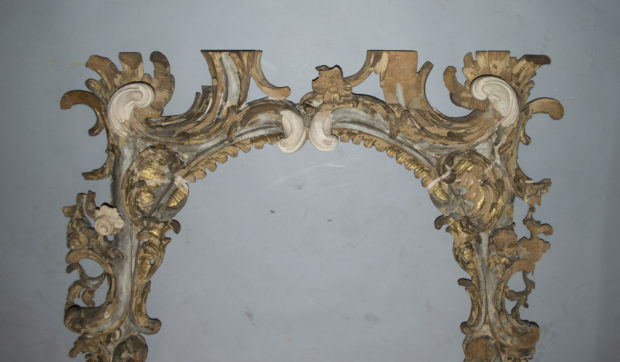 Form of the frame is typically oblique accompanied with stylised roses. 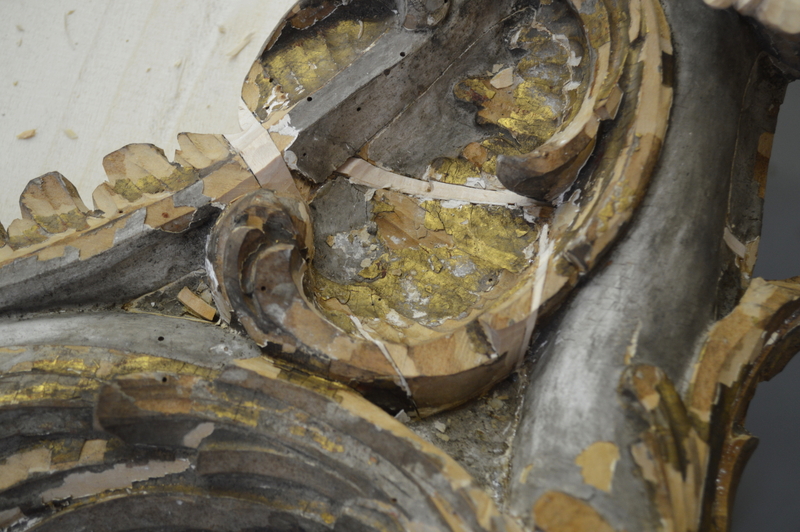 The origin is unknown, however possible origin is Church of All Saints in Hradisko, near to Kroměříž. 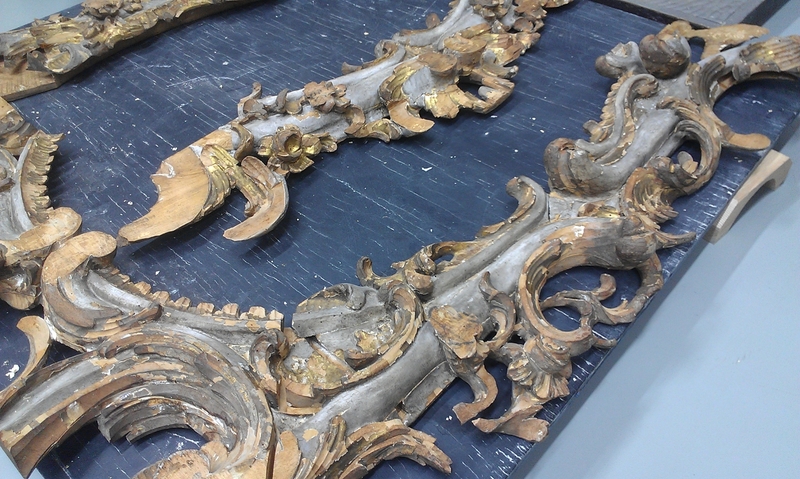 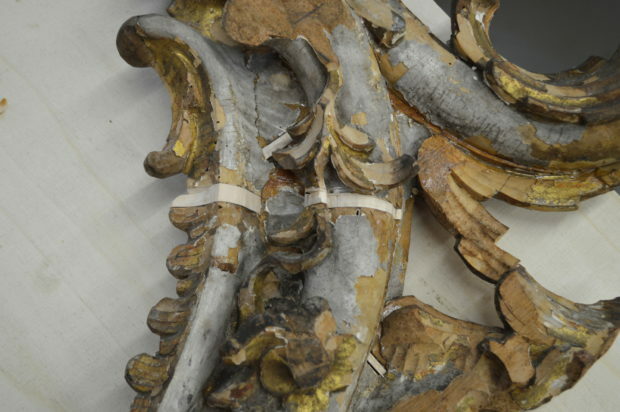 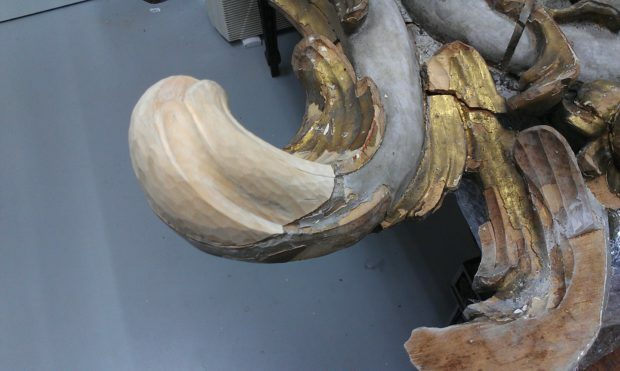 In the original state the frame was highly damaged. 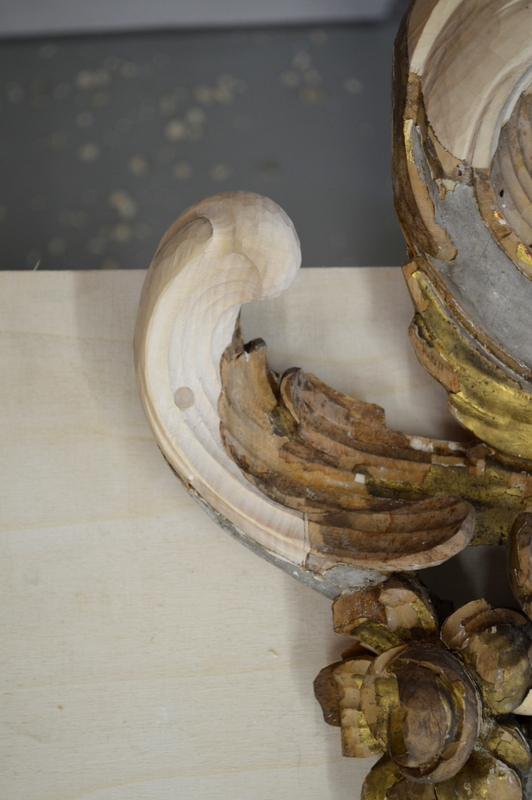 Material was shrinked and twisted, which caused gaps in corner joints. 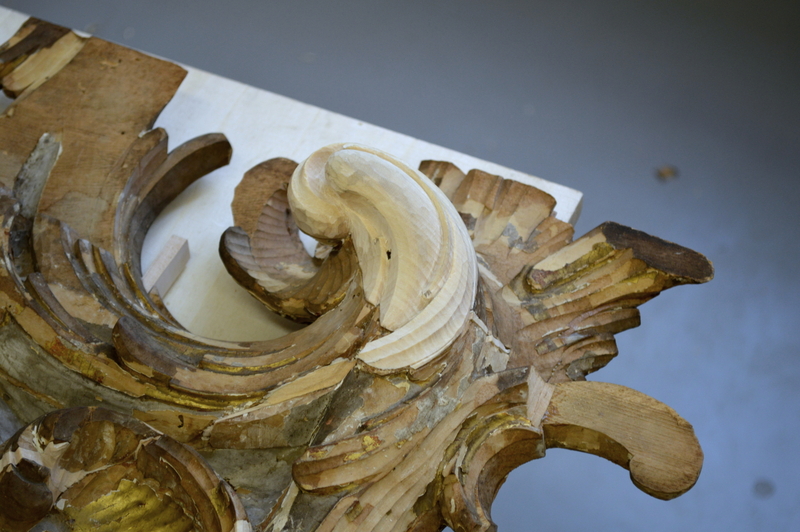 Three layers of boards forming one solid body of the frame were debonded. 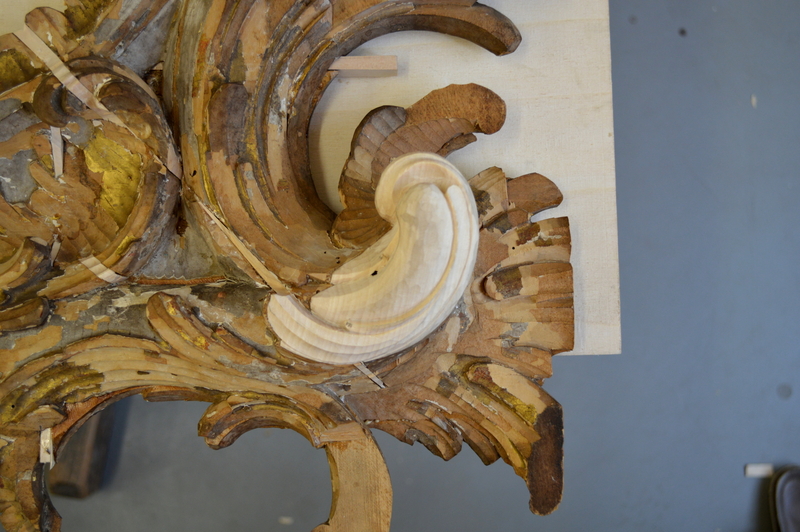 Fourth layer forming upmost parts of relief was mostly lost. 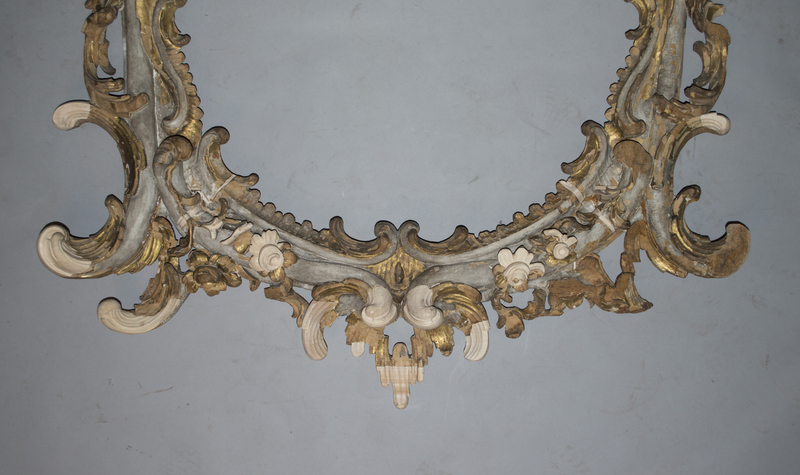 That caused an absence of important parts of this frame. Also significant part of the frame above painting was broken off and lost. Polychromy was also damaged and flaking off the frame’s surface. 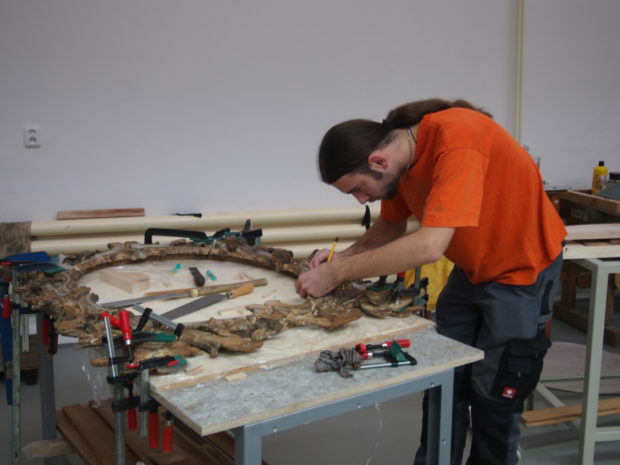 Petr Grenar, my schoolmate, was helping during the restoration. 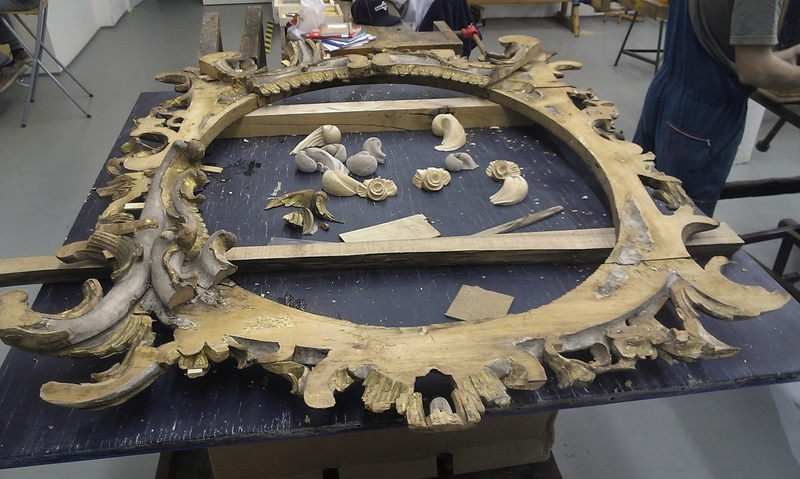 The polychromy of the frame was re-bonded to the wooden surface before it fell into our hands. 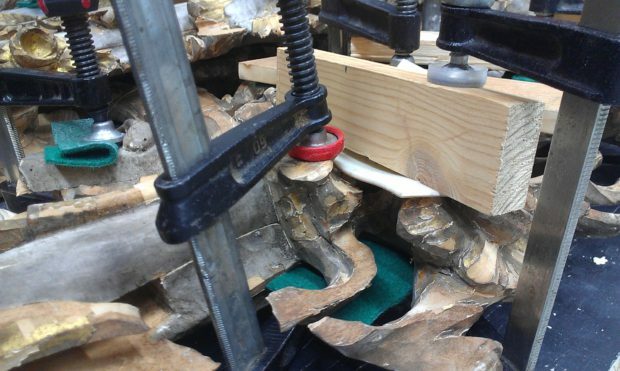 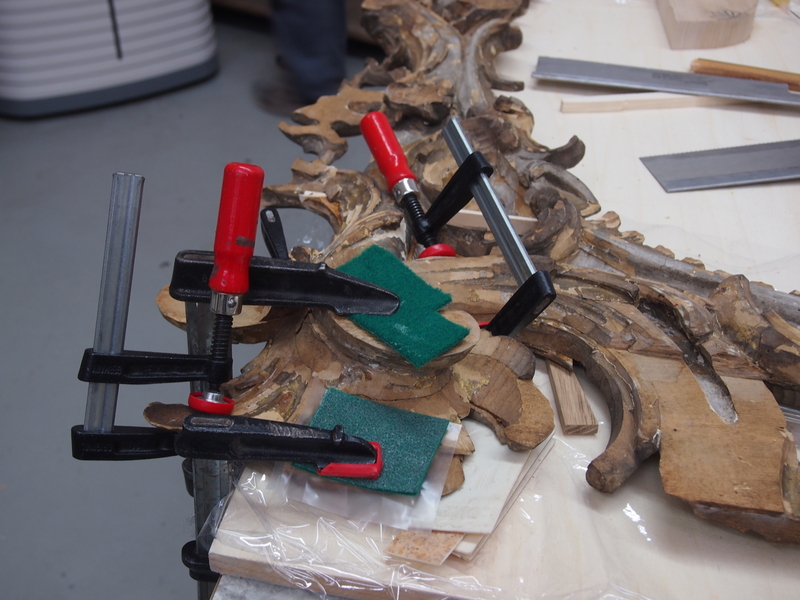 We carefuly began with debonding individual parts of the frame, because we considered injecting glue to the joints as a not good way. 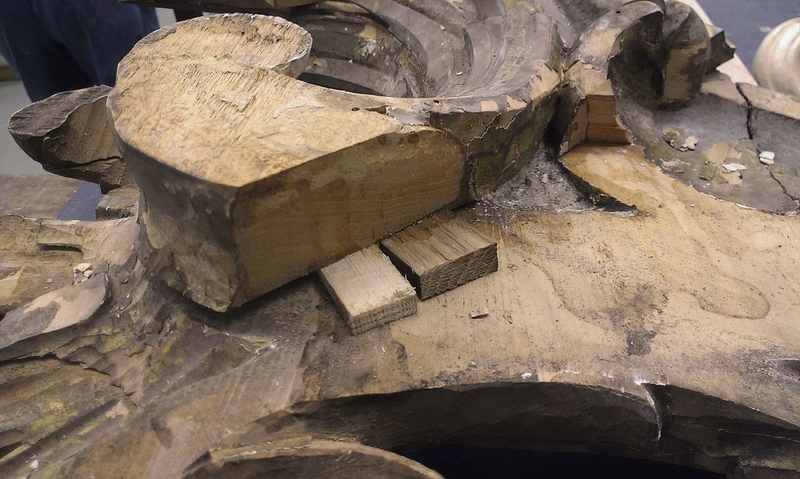 Joints would be weak because of dust and dirt. 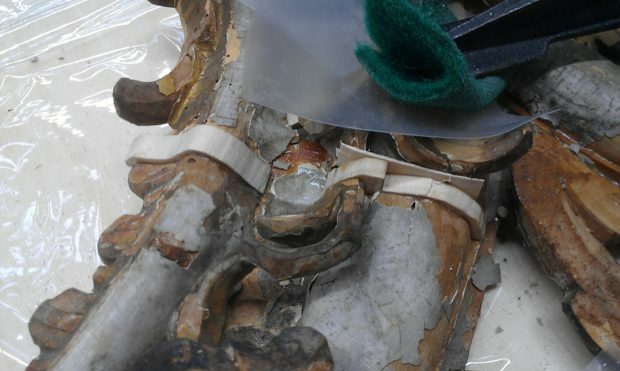 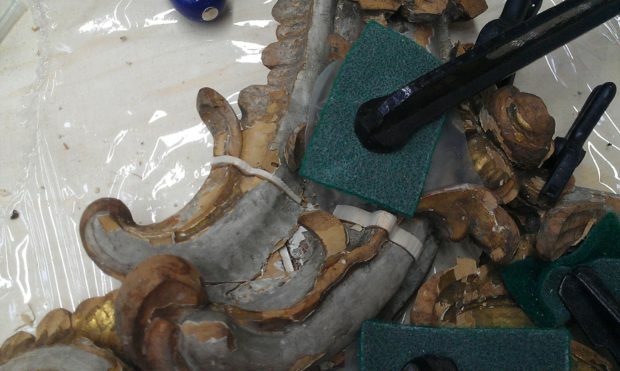 The contact areas of these individual parts were cleaned with water. After this step we began with gluing these parts together. 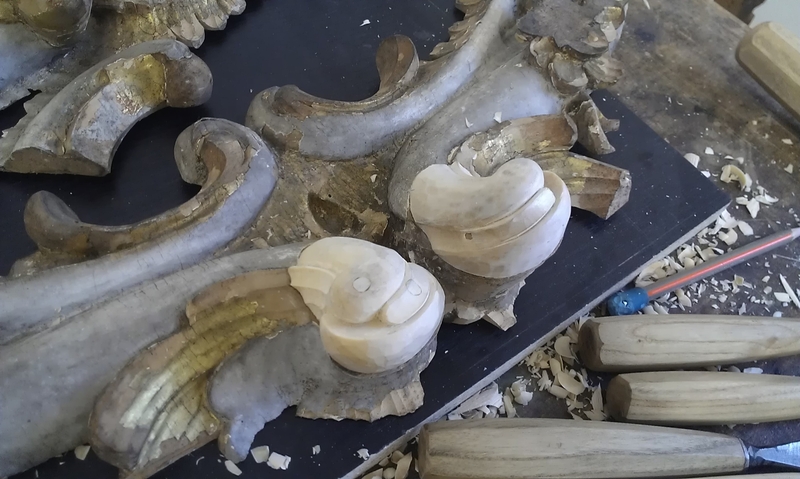 Due to the considerable shrinkage, we had to make a compromise in continuity of the shapes and surfaces to reduce steps between individual layers. 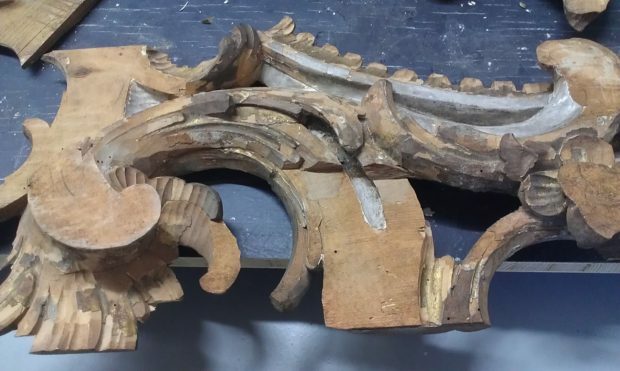 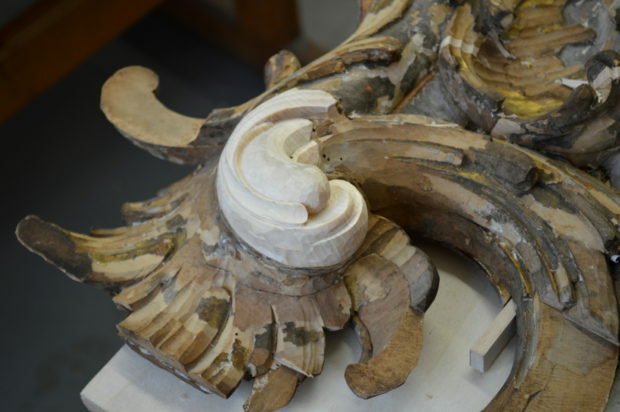 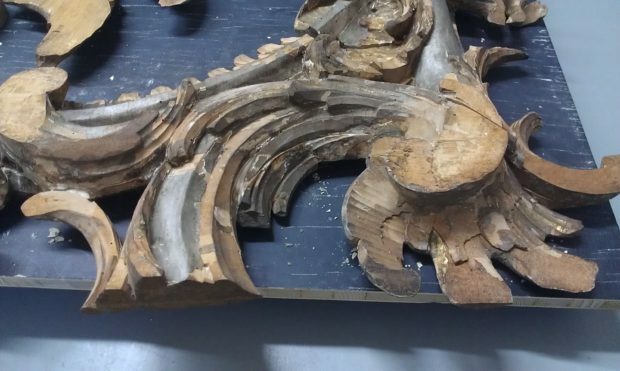 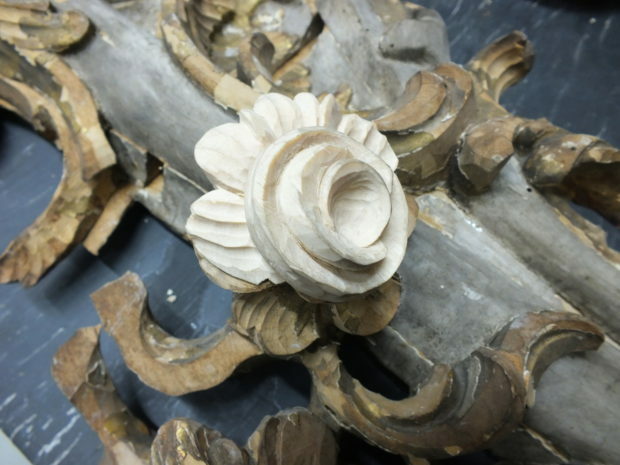 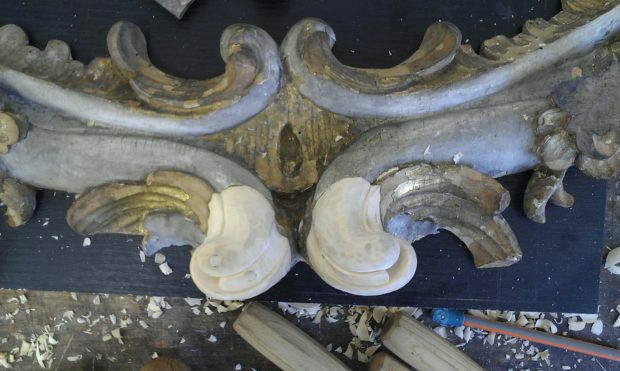 Next task was making the missing parts of the carving. Several big parts I carved out of the frame, some parts I glued directly to the frame and carved then. Reconstructing of missing parts showed as a difficult part of this task, because I had to base on preserved parts. 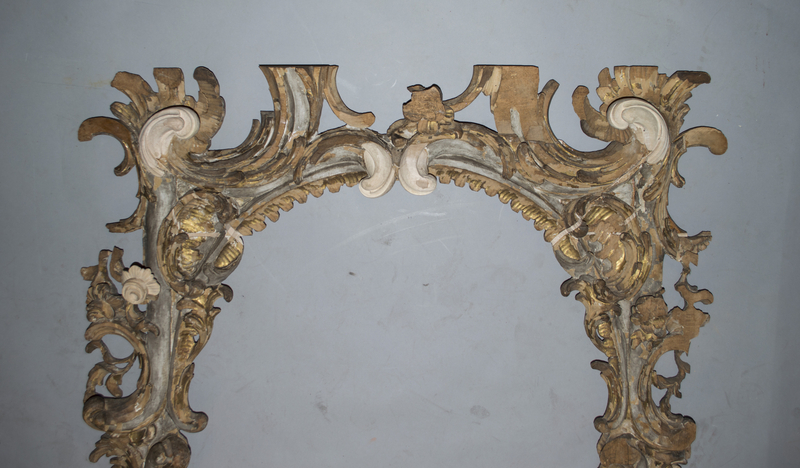 As I already mentioned, top part of this frame is missing. 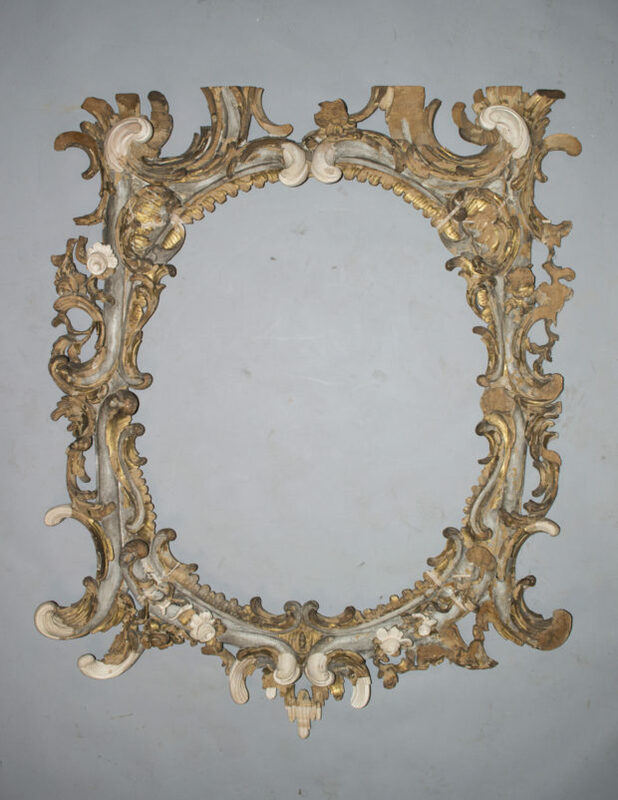 It propably constituted quarter of frame’s height, so I considered some research of possible look as very important. 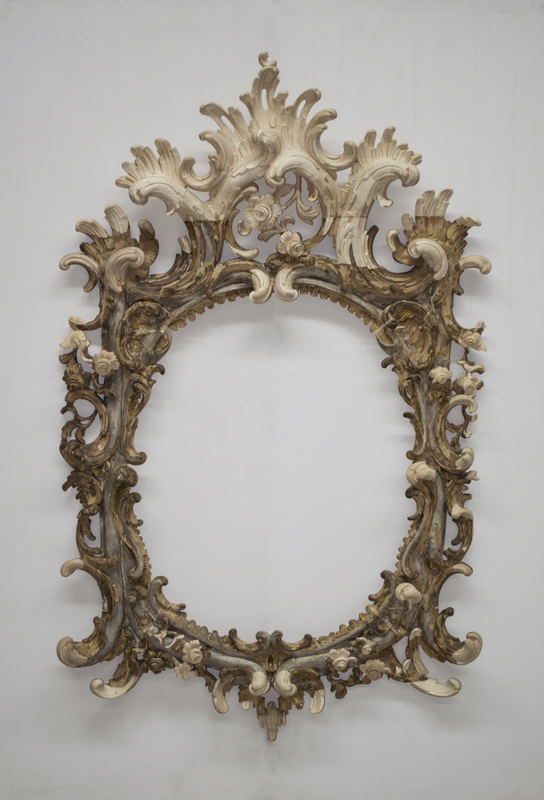 After a lengthy searching for the similar frame, I encountered a publication Olomoucké baroko (Olomouc Baroque) published for exhibition. 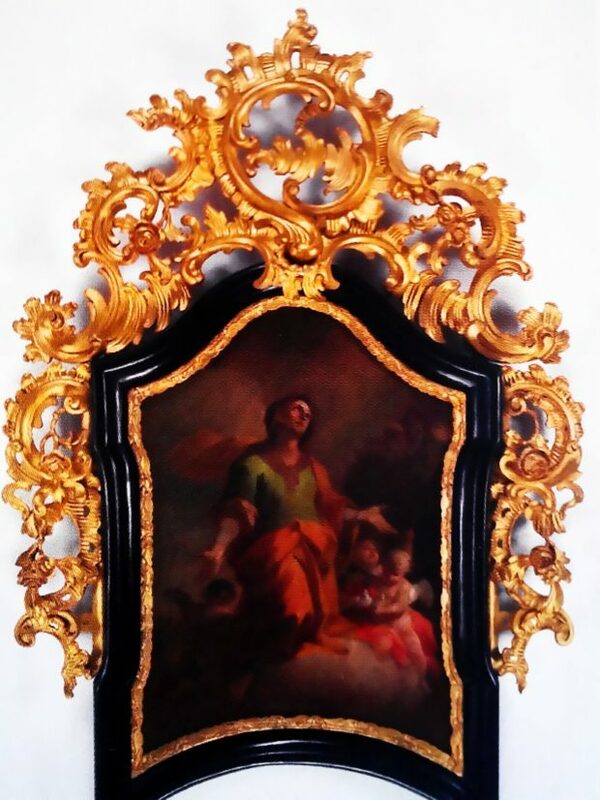 That is where I found photos of two similar frames from church of Saint Giles in Dvorec (district Bruntál) dated to late 18th century with painting by Josef Ignác Sadler. 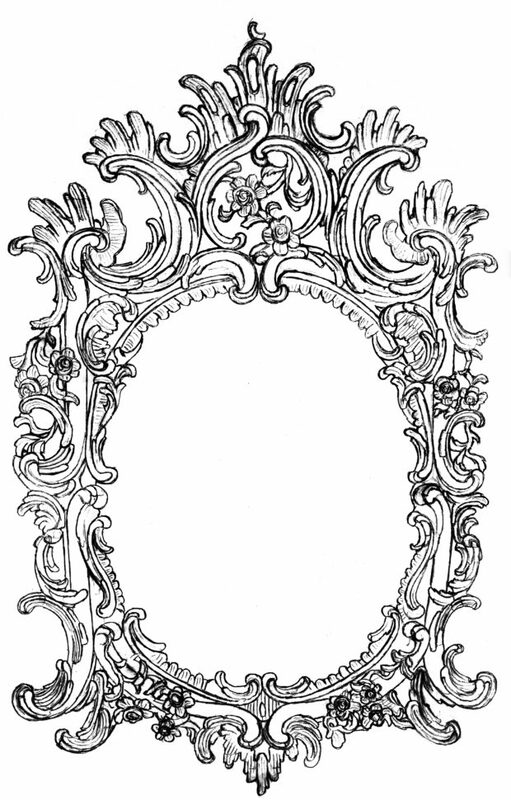 According this frame I drawed a possible original look. 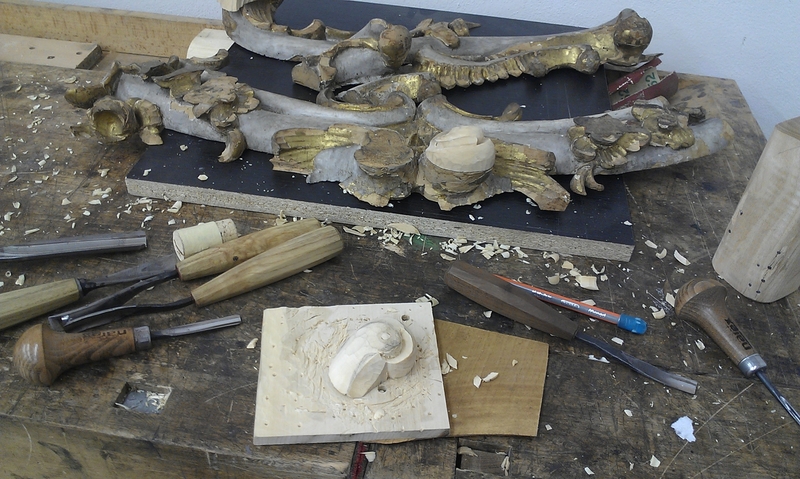 The biggest missing part was too difficult to made in time, so skilled woodcarver Petr Novotný helped and carved it.